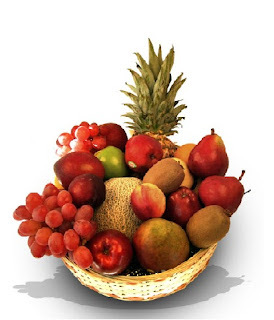 So consider sending some fruit with Bloomex for your next occasion and turn someone's sour day sweet. Here are a few ideas to get you started. It's often said that many cultures in Europe have a taste for the finer things in life. Witness this fruit sampler basket, which comes with four pears (two Green D'Anjou and two D'Anjou), four apples (two Fuji apples and two seasonal selections) and two Royal Naval Oranges. Perfect for a picnic or to send to a couple for their hospitality. Bon appetit! "Apples n' Oranges (and a whole lot more)"
This exquisite collection is premium in every sense of the word. Expect three Gala Apples and two Granny Smith's. Top it off with a couple of D'Anjou Pears, two branches of grapes, two extra large plums, three oranges and a pineapple. Phew, we're out of breath just listing those. A great gift for a small family to share. A perennial best-seller at Bloomex, our Classic Fruit Basket stands the test of time with an array of fresh fruits. 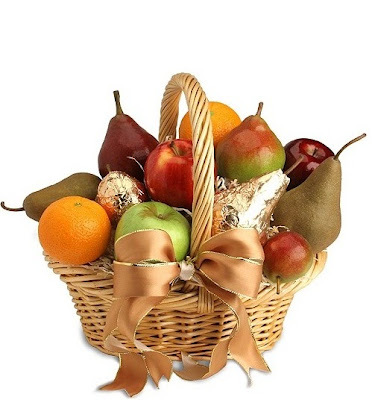 This basket includes four each of bananas, apples and pears; three oranges; two nectarines, two bunches of grapes and one pineapple, adorned by a small cut flower bouquet. A really gorgeous, flavorful way to let someone know you appreciate them or are thinking of them. Wow. Now that's one sweet basket. Can't find the right mix of what you want in the basket you're sending, and what you're looking to pay? Let Bloomex create one for you. Click here to go to the custom basket page for info, or call 1-888-912-5666 to arrange your basket and get a price today.